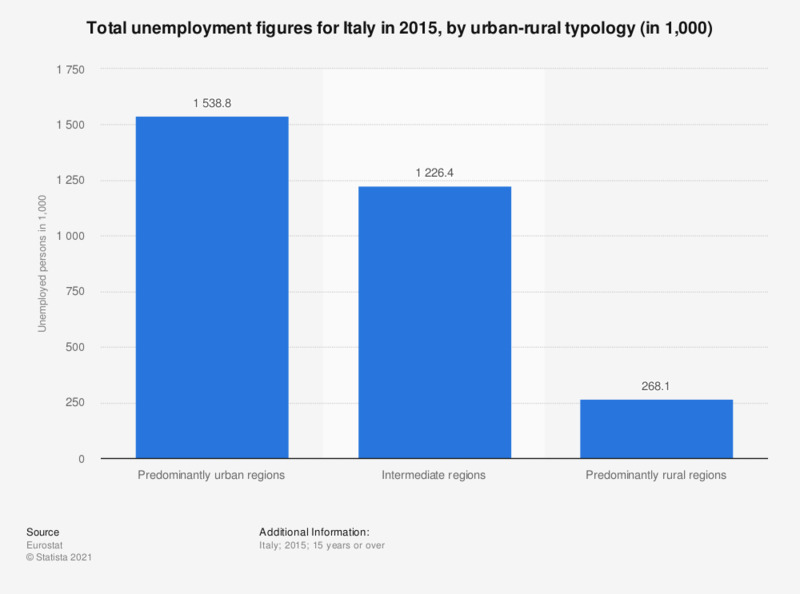 This statistic displays the total unemployment figures for Italy in 2015, by urban-rural typology. The number of unemployed people for predominantly urban regions in Italy in 2015 was of approximately 1.5 million. - 'Predominantly rural' if the share of the population living in rural areas is higher than 50. - 'Intermediate' if the share of the population living in rural areas is between 20 and 50. - 'Predominantly urban' if the share of the population living in rural areas is below 20. "Unemployed people include persons aged 15 to 74 who are without work during the reference week, available to start work within the next two weeks and have been actively seeking work in the past four weeks or had already found a job to start within the next three months." Data coverage corresponds to code urt_lfu3pers of the regional statistics and geographical information unit (E4). Statistics on "Key economic indicators of Italy"